Alaska Real Estate News, Valley Market Real Estate / For Buyers / A Great Price on a Brand New Wasilla Home!! A Great Price on a Brand New Wasilla Home!! This home at 6640 Lark in Wasilla is finished and ready for occupancy. It has a split bedroom design with a master suite on one side of the house and two other bedrooms on the other end. In between is a generous living room with the dining room and kitchen. The kitchen has hickory cabinets with stainless appliances. 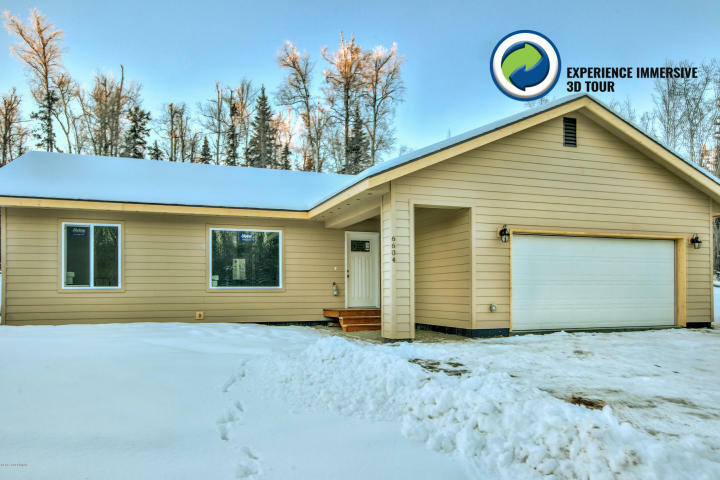 It has a generous sized two car garage and sits on a quiet lot in Southland about 15 minutes from downtown Wasilla. This home was built by Nolan Construction, a family operation. They take great care in their work to construct a home that you will love for years to come. This is a 5 star energy rated home. They have enclosed soffits, covered entry, on demand water heater, and other extras for no additional cost. Check the info here: 6640 Lark Info Make sure to watch the virtual tour. Call your Realtor right away for a viewing of this home. If you don’t have a Realtor call or text any of us on the contact list here.